30 Minute Easy Chicken Piccata is perfect for a quick weeknight dinner, but it’s also elegant enough to serve at a dinner party. The lemon-garlic, butter sauce will have you licking your plate! Chicken Piccata is a traditional Italian dish that’s simple, elegant and so delicious. In Italian, Piccata translates to piquant or piquancy, which means tart or zesty. This dish does have a tart sauce made from lemon, white wine and capers, but it’s also silky, creamy and totally decadent. 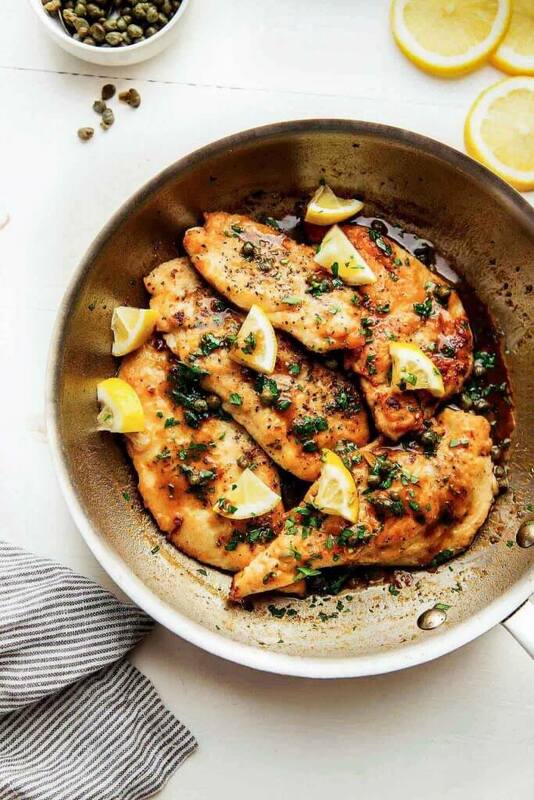 Plus, this lemon chicken piccata can be yours in just 30-minutes! Because the chicken is pounded thin, it cooks extremely fast. You make those thin cutlets by cutting a chicken breast in half, horizontally, and then pounding each half thin using a meat mallet. Don’t be intimidated here. Just place your chicken between two sheets of plastic wrap and flatten the breasts out to about 1/4 inch-thickness. Then comes the dredging in flour. This is what helps get those chicken cutlets nice and golden and a bit crispy on the outside. To “dredge,” pour the flour into a shallow dish and dip each chicken breast into the flour, shaking off any excess flour and gently coating each of them in the mixture. One word of caution when you’re making the sauce – Be sure not to overcook your garlic or it can become bitter. It helps to let your skillet cool down a bit after frying up the chicken. You don’t want the skillet scorching hot. Instead, now you want your skillet heated to medium. Also, don’t let the slices cook for any longer than the 30 seconds called for… They turn golden in an instant. Once they’re reached that color, immediately add in the white wine, chicken stock and lemon juice and watch it sizzle away and reduce until that magical consistency is reached. Plus, can we talk about the capers? Those capers! I had to hold myself back on this recipe. I’m a bit obsessed with them. It took everything I had in me not to add the whole jar into this chicken piccata. Whole jar aside, this sauce is still a bit heavy on those briny little guys. If you’re not into them, feel free to cut back on them a bit, or, go ahead and just dump that whole jar in there… You will be my spirit animal. I tend to serve this lemon chicken piccata up with some rice that I cook up in my Instant Pot. It’s also great served alongside some buttered egg noodles or mashed potatoes. On the side, I’ll either serve some roasted broccoli or this fennel & celery salad. But, the most important accompaniment (as always) is the wine! I’ve tried several different wines with this dish – Sauvignon Blanc, Pinot Gris, Pinot Blanc, but most recently, I’ve fallen in love with pairing this chicken piccata with Chardonnay. Its hints of lemon, baking spices and the creamy finish just make it the perfect match for the lemon sauce on the piccata! 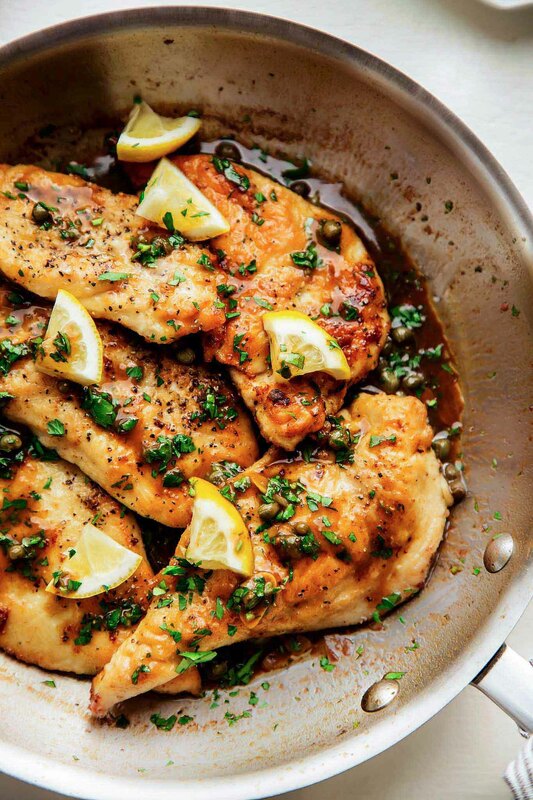 I hope you love this lemon chicken piccata as much as I do. It’s a quick dinner that’s on regular rotation at our house. Do you have any dinner recipes that you reach for time after time? If you loved this Easy Chicken Piccata recipe I would appreciate it so much if you would give this recipe a star review! Also, be sure to snap a picture of your finished dish and share it with me onInstagram using the hashtag #platingsandpairings and tagging me @platingsandpairings. This 30-Minute Easy Chicken Piccata makes a quick and easy weeknight dinner, but it’s also elegant enough for a dinner party at home. The lemon, garlic, butter sauce will have you licking your plate! Season the chicken on both sides with salt and pepper. Place the flour in a shallow bowl and dredge the chicken in it. Shake off the excess. In a large frying pan over medium-high heat, warm 2 Tbs. of the olive oil. Place 2 pieces of chicken in the pan and cook, turning once, until browned on both sides, 2 to 3 minutes per side. Transfer to a platter and keep warm under a tent of foil. Warm the remaining 1 Tbs. oil in the pan and repeat to brown the remaining chicken. Place that chicken under your foil tent as well. Reduce the heat to medium and melt 1 Tbs. of the butter in the pan. Add the garlic and cook until golden brown, about 30 seconds. Add the wine, lemon juice and broth, increase the heat to medium-high and cook until the liquid is slightly reduced, about 5 minutes. Remove the pan from the heat and whisk in the remaining 2 Tbs. butter, the capers and parsley. Season with salt and pepper. Drizzle the sauce over chicken and serve immediately. Note: This post for Easy Chicken Piccata was originally published in December, 2014. The recipe remains unchanged. However, the photographs and content have been updated. Chardonnay has hints of butter and citrus that pair amazingly well with this Chicken Piccata. Sauvignon Blanc has bright citrus and herbal notes that pair nicely with the lemon and parsley found in this dish. 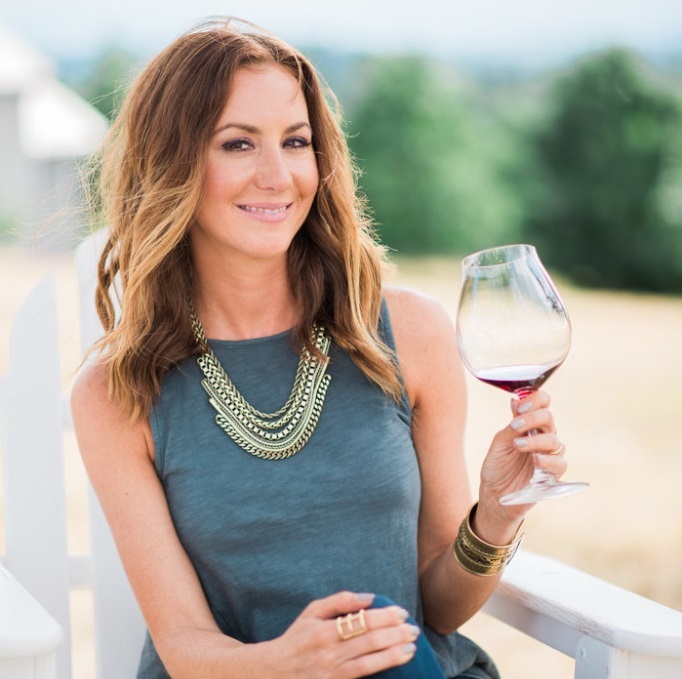 Pinot Grigio and Pinot Blanc are a nice match with their crisp minerality and citrus notes. For something unexpected, and budget friendly, try a Vinho Verde. I like this chicken dish on top of rice or Quinoa so it soaks up that sauce! Me too Pech – I love this piccata on top of rice. Loved this recipe, and my hubby did as well. It is so easy and so very yummy. Thanks for sharing this, it will be one of my go-to dishes. I’m so happy to hear that you liked it! This is definitely one of my favorite recipes on the blog! Chicken piccata is so yummy and I love that it can be made in 30 minutes! Me too Marlynn! Piccata is definitely my go-to dish when I’m stumped on what to make for dinner. Everyone loves it too! I’m vegan but my husband is not and I know he would love this dish. Thanks for sharing this great recipe. Of course Sam – I hope he enjoys! 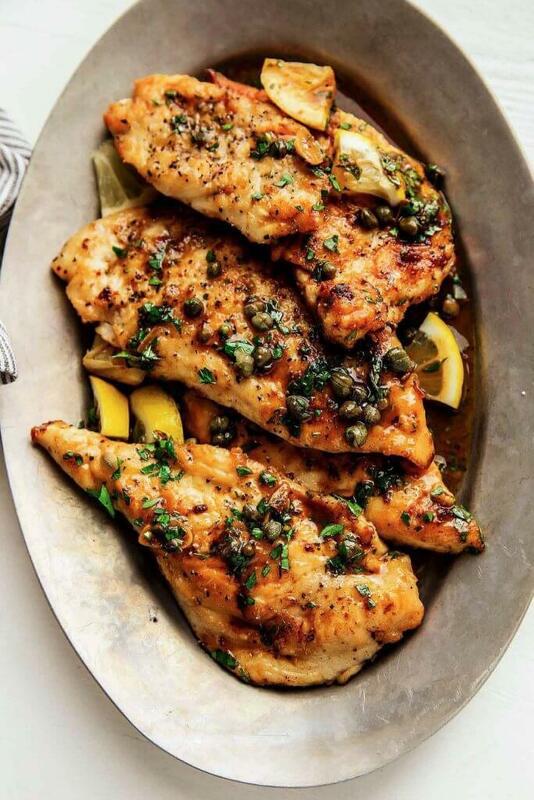 I’ve never tried Chicken Piccata before but this looks so heavenly. Plus all the ingredients you listed are mostly available at home now too, just have to buy the chicken. I’m bookmarking it for my next chicken dish. Yumm! I hope you have the chance to make it soon – I really think you’ll love it Juventia! You’re totally right – so easy to make, but it seems so fancy! Perfect, versatile dish! Right?! It’s one of my go-to dinner party dishes for sure! This looks so good! Perfect for a quick weeknight dinner. Definitely saving this one! I am ALL about anything with capers – this looks incredible! 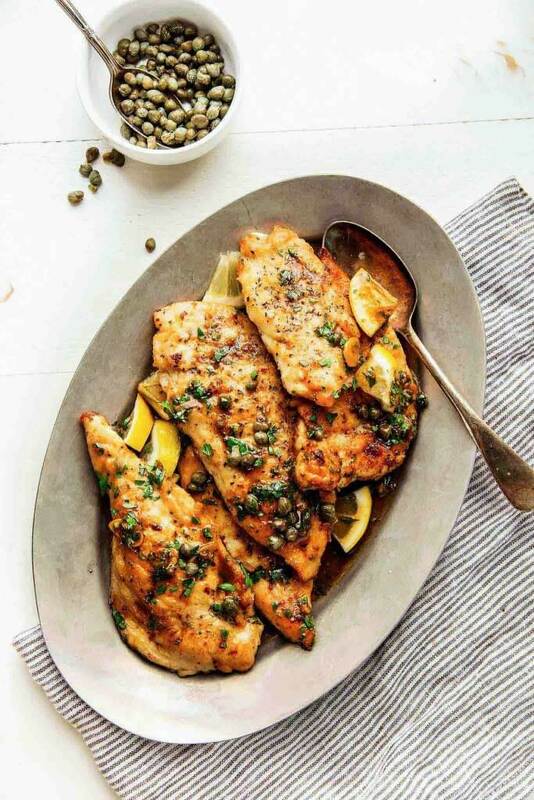 I love Chicken Piccata and this recipe and your photos make me want to dive in! And those capers, all I can say is yum! Thanks Sharon – I am obsessed with capers!!! Amazing, I love Chicken Piccata. I tried it. Its delicious. Your recipes are superb. Thanks for sharing. So glad you liked the piccata! This is one of my favorite quick and easy recipes Pavitra! Caesar salad, risotto, Chardonnay , Tiramisu..Mangia, Mangia !! Making this recipe tomorrow night for all of my Family.. Hope they all like it. And it sounds so yummy too. Looks so yummy Hope the Family likes it also. I hope so Susan – I’d love to hear what they think!